Liczba stron: 7042 Jest to ujednolicona liczba stron, która ułatwi Ci porównanie długości książek. Każda strona Legimi to 200 słów. Edith Nesbit was born in Kennington, Surrey, the daughter of agricultural chemist and schoolmaster John Collis Nesbit. The death of her father when she was four and the continuing ill health of her sister meant that Nesbit had a transitory childhood, her family moving across Europe in search of healthy climates only to return to England for financial reasons. Nesbit therefore spent her childhood attaining an education from whatever sources were available – local grammars, the occasional boarding school but mainly through reading. At 17 her family finally settled in London and aged 19, Nesbit met Hubert Bland, a political activist and writer. They became lovers and when Nesbit found she was pregnant they became engaged, marrying in April 1880 when Nesbit. After this scandalous (for Victorian society) beginning, the marriage would be an unconventional one. Initially, the couple lived separately – Nesbit with her family and Bland with his mother and her live-in companion Maggie Doran. Nesbit discovered a few months into the marriage that Bland had been conducting an affair with Doran, fathering a child with her and previously promising to marry her. Though they argued ferociously Nesbit did not end the marriage, choosing instead to move in properly with her husband and become friends with Doran. She then began to help support Doran and her own family financially by writing and selling sentimental poetry. Nesbit’s writing career therefore truly began as a need to support another woman’s child. As the family grew Nesbit and Bland became increasingly politically active. In 1883 they were amongst the founding members of The Fabian Society, a socialist group that would have an enormous effect on the politics of Britain over the next century. The couple named their third child Fabian after the society. At around the same time Nesbit invited her close friend Alice Hoatson to live with the family as housekeeper and secretary, as Hoatson was pregnant out of wedlock. Nesbit agreed to adopt the child to prevent a scandal. However after the child was born it became clear that the father of the child was none other than Nesbit’s own husband - Bland. Nesbit demanded that the mother and baby leave her house; however Bland refused to allow it, stating he would leave her in turn if they could not remain. Nesbit relented and adopted the baby, Rosamund, and later dedicated her book ‘The Book of Dragons’ to her. Initial Edith Nesbit books were novels meant for adults, including The Prophet's Mantle (1885)and The Marden Mystery (1896) about the early days of the socialist movement. Written under the pen name of her third child ‘Fabian Bland’, these books were not successful. Nesbit generated an income for the family by lecturing around the country on socialism and through her journalism (she was editor of the Fabian Society’s journal, Today). Between 1899 and 1900 Nesbit’s life altered dramatically. In 1899 Alice Hoatson had another child, John, with Bland - whom Nesbit dutifully adopted as her own son. That year the family moved to Well Hall House in Eltham, Kent. In 1900 her son Fabian died suddenly from tonsillitis – the loss would have a deep emotional impact and numerous subsequent Edith Nesbit books were dedicated to his memory. These personal upsets were occurring at the same time as the Nesbit’s increasing success and fame as an author for children. In 1899 she had published The Adventures of the Treasure Seekers to great acclaim. It would become hugely influential on children’s literature as it moved the genre away from fantastical other worlds and contrived problems to issues in the real world, showing children as they are, not as they ought to be. 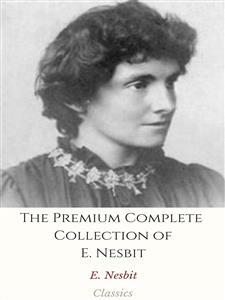 In the new century Nesbit dedicated herself to writing, completing such classics as The Railway Children (1906) and Five Children and It (1902). She is often thought to be the first modern writer of children stories, though she continued to write for adults. She also continued her political involvement, lecturing at the newly founded London School of Economics. In 1914, having been going blind for many years and being supported entirely by Edith, Bland died. Three years later she married Thomas "the Skipper" Tucker, the ship’s engineer on the Woolwich Ferry. They would be together for the remainder of her life. Suffering from lung cancer Nesbit moved to New Romney, Kent. She died in 1924. Her husband carved her headstone, which remains in the churchyard of St Mary in the Marsh, where she is buried. She had continued to write until her death, publishing over forty-four novels in her lifetime.